Yan Liang can use any spade from his hand as duel. If he uses his last hand card, the target needs to use two attacks to fight back. These Duels can be negated. To make his power more effective, he must use it as a Duel. If he uses it within a Duel as an Attack, it will not matter. 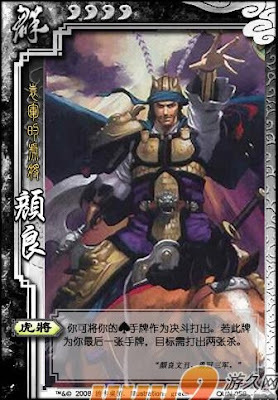 If the other player responds to this super-charged Duel, Yan Liang has no hand, so he will take the damage. The target will not have to worry about playing two Attacks again.